When you begin downloading a file in an Android Smartphone or tablet, you can see its progress by sliding down the navigation drawer. But it doesn’t have the controls that allows you to say, pause a download or more importantly, cancel the current download. So if you want to stop the current file downloads in Android, your best bet is to disconnect the wifi or 3g internet connection. Another way is by opening up the download app and deleting the currently transferring files if possible. Otherwise, you can clear the data of the said app. This can get confusing for many but can save a lot of bandwidth and time if you accidentally click on a large file. Instead of waiting for it to complete to download, simply learn to cancel it. This is by far the simplest method. If you have unwanted files that are downloading, just stop the internet. Turn off the Wi-Fi and/or 3G internet that your phone is currently connected to. 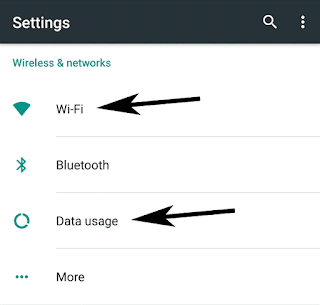 To turn off the Wi-Fi: You usually go to Settings > Wireless & networks > Wi-Fi and tap on the slider to move it towards the left so that the connection is off. To turn off your 3G: Visit the same Settings > Wireless & networks > Data usage and tap on the slider of Cellular data to turn it off. When a file download is in progress, access your app drawer and open an app called Downloads. In that app, you will see the history of your downloads (If you have not cleared it). In the list, you will also see the in progress download file. Long press on it and depending on your Android version and build, there might be an option to delete or remove it. You will have to confirm your action. This is a rather different method that clears the data i.e. all the information stored by your download app. This is not the data connection. Usually under Device, you will find Apps. Tap on it. Find the App called Downloads or something similar under the All. Press the button that says Clear Data and confirm your action. You can also click on Force Stop. Note: You can also access the app settings by dragging down your status bar, long pressing on the download information and then tapping on App info. 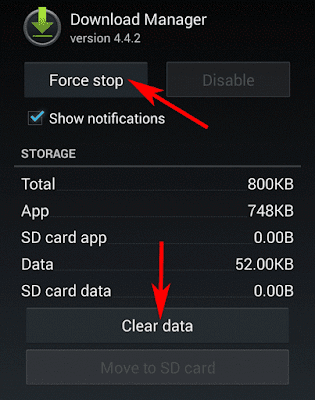 This methods should help you clear off and cancel current file downloads in your Android phone.